The California company that eventually developed into Metlox Pottery was started around 1920 by the Prouty family who sold their wares as ProutyLine Products. Combining parts of the words "metal" and "oxide," the substance that gives pottery its vibrant colors, eventually resulted in the Metlox moniker. In the late 1920s and early '30s, looking for more ways to increase revenue during the difficult economy resulting from the Great Depression, Metlox began producing housewares that quickly grew in popularity. Prior to that time, the company focused on making large ceramic signs for theaters and other businesses. The company's foray into the dinnerware business in the early 1930s included the prolific Poppytrail line. This dishware line sustained as a popular seller for many years, and even today it has quite a following with collectors. Also known as the "200 Series," Poppytrail pieces were produced in 15 enticing hues including old rose, sea green, delphinium blue, canary yellow, rust, turquoise, and poppy orange. Of all the bright colors, poppy orange is the most commonly found. Poppytrail dinnerware can also be located in pastel colors of powder blue, petal pink, satin ivory, satin turquoise, peach, pastel yellow, and opaline green. These don't coordinate well with the brighter pieces but do make a nice collection when displayed on their own. Evan Shaw, known for producing a line of ceramic Disney figurines also sought by collectors, purchased Metlox Pottery in 1946 and continued to expand the company's dinnerware lines. He bought the Vernon Kilns name and molds as well when the manufacturer closed in 1958, according to an article originally printed in The Daze, a popular news source for Depression glass and pottery collectors. 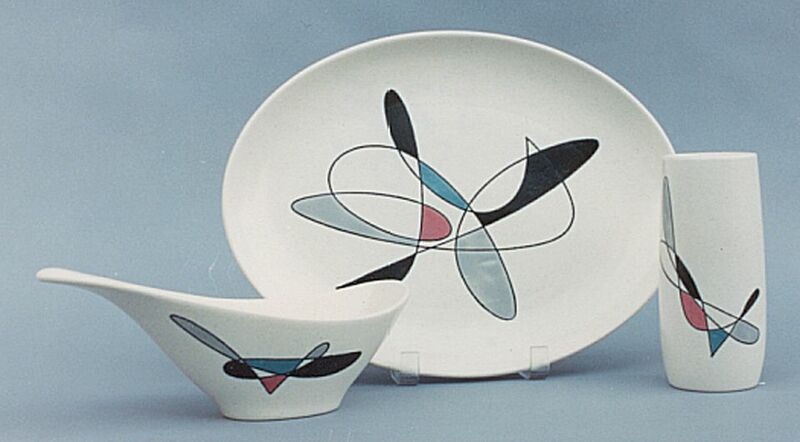 By the 1960s, Metlox dinnerware sales skyrocketed. Since the lines were readily available in major department stores, brides easily discovered and added the sets they wanted to complete to wedding registry lists further boosting sales. Some of the other dinnerware lines made by this company through the years are Delphinium, California Fruit, California Rose, Painted Desert, Sculptured Daisy, California Contempora, and Tropicana. The company even made a black and white cow printed set of dishes called Holstein Herd right before its closure in 1989. Metlox patterns with Mid-Century modern appeal are quite popular with both collectors and decorators today. On older Metlox dinnerware pieces the mark was incised into the pottery rather than stamped on. Some authentic pieces originally purchased from the Metlox factory have stamped on marks which are smeared, others are stamped cleanly. The incised mark is most desirable when it comes to serious Metlox collectors. Unmarked pieces can also be found, but they're not as valuable as those with the older, clearly defined mark. This isn't the case with all antiques and collectibles, but marks are of importance to avid Metlox collectors. Carl Romanelli, who designed some of the most highly sought after Metlox dinnerware patterns in the late 1930s and early '40s, also sculpted bud vases and figurines to look like nudes, animals, and sea life. These continue to bring good prices in the collecting community, especially the nudes. Under Shaw's command, a freehand stoneware designer named Helen Slater later produced a line of giftware for Metlox called Poppets. These whimsical creations were made of natural earthenware and hand thrown. Specially colored glazes and hand carved faces gave them unique appeal when they were new. In all, 88 different Poppets were produced with the Metlox name stamped on the bottom, and each came with a special box. A clever eight-piece band set was even commissioned by the Salvation Army. The company produced figural cookie jars and a number of ceramic figurines known as the "nostalgia" line. These generally feature vintage-style automobiles, horse-drawn carriages, trolleys, and other old-timey modes of transportation.